Best for quilt and patchwork piecing with 1/4" or 1/8" seam allowance. 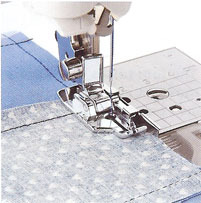 Its back and small needle opening are designed to give the right pressure to fabrics. 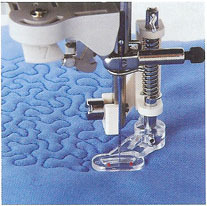 The large opening on the front of the foot gives you wide visibility in the needle area. 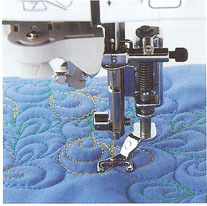 Use for free-motion, outline quilting etc. For Darning, quilting or free motion. 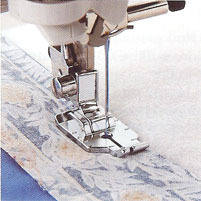 The foot raises and lowers with the needle to allow fabric to be moved between stitches and to hold fabric in place while stitches are created. For improved results when sewing or quilting on fabrics which tend to stick to the bottom of a presser foot or sheer fabrics that are difficult to control. A walking foot assists in keeping the lines matched on multiple layers of plaid fabrics.